Do you want to be a shark? The Junior State Championships take place during July school holidays. Players who play for Southern United can nominate to be part of this fun, exciting and challenging tournament. 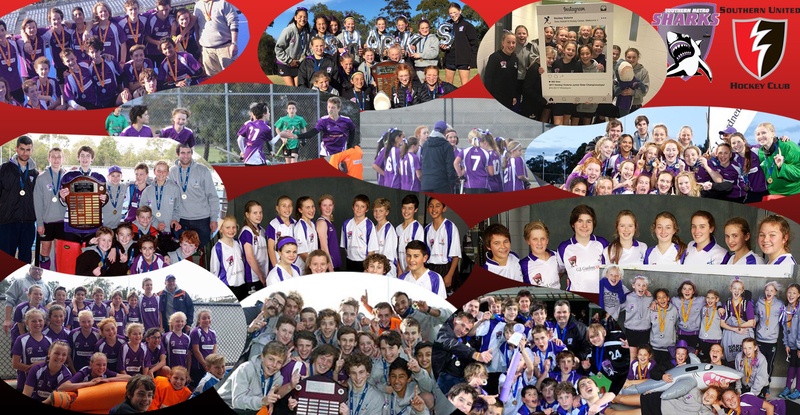 Every year in the July holidays are the Junior State Championships (JSC) for every junior hockey players in Metro Melbourne and Country Victoria. Every club is part of a zone and Southern United Hockey Club is part of the SHARKS zone together with other hockey clubs: Casey, Frankston, Greater Dandenong Warriors, Mentone, Mornington Peninsula, Old Haileybury, Peninsula WHA, Sandringham Women, Southern Knights, Southern United, St Bedes. The State Championships are a great experience, 4 days of hockey in a team with players from local clubs, as well as training, generally each Sunday between now and then.Trialling is a great experience, so sign up and trial and hopefully you will be part of the SHARKS team this year. In 2019 the tournament is from 2 -5 July at the State Netball Hockey Centre and at Hawthorn. For the 2019 Junior State Championships the age groups will be Under 13, Under 15 and Under 18.
Who can nominate for the JSC SHARKS? Players must be 10 years of age as of the 31st of December, 2018 to be eligible to participate in the 2019 JSC. The nomination fee to participate in the trails is $30 and is non refundable. Please note: to participate in the Junior State Championships all players must hold a 2019 Hockey Victoria Outdoor Playing Membership. The fee for participation in the 2019 JSC as a member of a Metropolitan Zone team will be $375. 1 x New Playing Shirt or GK smock – all players participating in the 2019 JSC will receive a new playing shirt with the cost included in their player fee. This is regardless of whether they received one in 2018. Payment details will be sent to all players once the selection process is complete. Is participation in JSC compulsory to be selected in a State Team? Participation is not compulsory however the JSC is an event that Hockey Victoria utilises to gather information on potential players for these state teams. If I am currently in an HV Academy do I need to nominate? Yes, all players wishing to be selected in the JSC must nominate and trial to be considered for selection.